"WE GOT SPIRIT! YES WE DO! WE GOT SPIRIT! HOW 'BOUT YOU?!!!!" We would scream this at the top of our lungs in order to win the highly coveted "Spirit Stick". It was a brutal ritual. 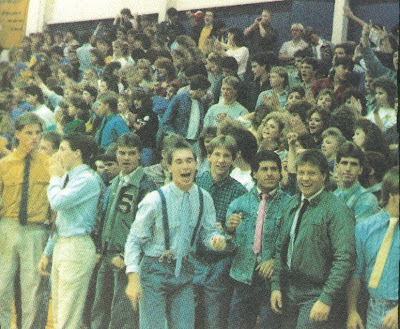 So much so, that according to my wife (Class of '93) they put a screecher to the spirit stick competition after the sophomores won the stick and a violent senior mob got out of control, trampling women & children. Ok - maybe women & children didn't actually get trampled... in fact there probably weren't any children there except for the sophomores. But, it did get so uncontrollable that they no longer allowed these barbaric displays of animalistic egotism and domineering rivalries for the rest of the year. I believe they reinstated this craziness the following year with new rules like, "Don't kill people" and stuff like that. 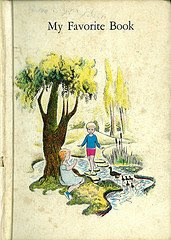 Can't we all just get along? 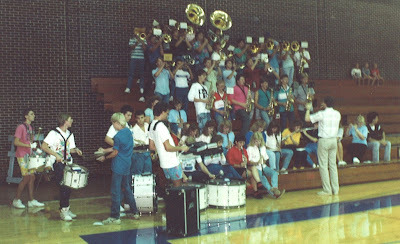 This picture of the pep band was taken at a pre-season rally we had at the gym one evening. Remember how a group of guys would spell out "Jackets" with their bodies at pep rallies? Loved it! And I absolutely loved hearing the tri-toms rev up for "George of the Jungle" and most of all...our FIGHT SONG! Wonder if there's any way we could get that on the playlist? S...H...S...Jackets...Go Jackets, let's go!!! Otis Wisely was unfortunately chosen to award the stick at a pep rally during our senior year. He was unfortunately mobbed by our class and did go down. I never have laughed so hard at the sheer look of terror in Mr. Wisely's eyes. It looked like a pack of hobos chasing after one ham sandwich.